The Lunar Reconnaissance Orbiter (LRO) is a Moon orbiting mission launched in June 2009. The first mission of NASA's Robotic Lunar Exploration Program, it is designed to map the surface of the Moon and characterize future landing sites in terms of terrain roughness, usable resources, and radiation environment with the ultimate goal of facilitating the return of humans to the Moon. The following measurements are listed as having the highest priority: characterization of deep space radiation environment in lunar orbit; geodetic global topography; high spatial resolution hydrogen mapping; temperature mapping in polar shadowed regions; imaging of surface in permanently shadowed regions; identification of putative deposits of appreciable near-surface water ice in polar cold traps; assessment of meter and smaller scale features for landing sites; and characterization of polar region lighting environment. A primary goal of the mission is to find landing sites suitable for in situ resource utilization (ISRU). LRO launched along with its companion spacecraft, the Lunar Crater Observation and Sensing Satellite (LCROSS), from Kennedy Space Center on 18 June 2009 on an Atlas 5 401 launch vehicle at 21:32 UT (5:32 p.m. EDT). LRO and LCROSS separated at 22:16:43 UT. LRO will be put into a direct insertion trajectory and will reach the Moon on 23 June at 09:43 UT (5:43 a.m. EDT). It will enter an initial 5 hour orbit with a periselene altitude of roughly 100 km which will then be lowered into a 50 km circular orbit. 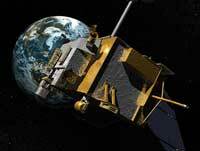 The mission is expected to last for one year in a 30 - 70 km altitude lunar polar orbit. This may be followed by an extended mission of up to 5 years in a higher altitude (30 x 216 km) low-maintenance orbit. The satellite is expected to have a launch mass of about 1846 kg, and a dry mass of less than 949 kg. The platform will be three-axis stabilized and power of about 1850 W (end-of-life), giving 800 W average over each orbit, will be provided by a 10.7 square meter solar array and stored in an 80 A-hr Li-ion battery. Communications will be via S-band for uplink and low rate downlink and Ka-band for high rate downlink (100-300 Mbps). The spacecraft will carry 92 kg of scientific payload which will be composed of: Lunar Reconnaissance Orbiter Camera (LROC), a high resolution (60 cm) camera to acquire images of small scale landing site hazards and document lighting conditions at the lunar poles; Lunar Orbiter Laser Altimeter (LOLA), a laser altimeter to measure landing site slopes and search for polar ices; Lunar Exploration Neutron Detector (LEND), a neutron detector to search for water ice and characterize the space radiation environment; Diviner Lunar Radiometer Experiment (DLRE), a radiometer to map the temperature of the lunar surface to identify cold traps and possible lunar ice deposits; Lyman-Alpha Mapping Project (LAMP), a Lyman-alpha mapper to observe the lunar surface in the far ultraviolet, looking for surface ices and frosts and imaging permanently shadowed regions; and Cosmic Ray Telescope for the Effects of Radiation (CRaTER), a device to investigate background space radiation using tissue-equivalent plastics. NASA has also signed an agreement with the U.S. National Reconnaissance Office to cooperate on the development of Mini-RF, a miniature synthetic aperture radar sensor to map the Moon's surface. Total payload power requirement is about 125 W. The total estimated total cost for the mission is roughly $460 million. 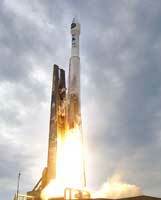 The Lunar Crater Observation and Sensing Satellite (LCROSS) was launched along with the LRO spacecraft. LCROSS is designed to search for water ice on the Moon's surface. The mission consists of a Shepherding Spacecraft (S-S/C) attached to the Centaur upper stage. The S-S/C will guide the Centaur after orbital insertion through two highly eccentric 40 day earth orbits. The S-S/C then guides the Centaur into a trajectory which will cause it to collide with a pre-selected permanently shadowed site on the Moon, chosen for its likelihood of containing water ice. The S-S/C will separate from the Centaur and perform a delay burn o follow ten minutes behind. The Centaur will impact the lunar surface, throwing up a cloud of debris, possibly including water, hydrocarbons, and/or hydrated material. The S-S/C will take images and collect other data on the impact and cloud of ejecta before also striking the Moon. The S-S/C is built on an EELV Secondary Payload Adaptor (ESPA) ring with a dry mass of approximately 534 kg and 300 kg of hydrazine propellant. Power is supplied by a 420 W solar array charging a 40 A-h Li-Ion battery. Propulsion is through two 8-thruster pods and communications will be via two omnidirectional and two horn antennas. The S-S/C will be equipped with two visible cameras, three infrared cameras, three spectrometers, and a photometer for observations. NASA launched the Lunar Reconnaissance Orbiter, an unmanned mission to comprehensively map the entire moon, on June 18, 2009. One of the instruments aboard, the Diviner Lunar Radiometer Experiment, will make the first global survey of the temperature of the lunar surface while the orbiter circles some 50 kilometers (31 miles) above the moon.